The 1994 car wouldn’t be ready for several weeks, so Williams adapted the 1993 FW15 for the 1994 regulations. Electronic driving aids such as active suspension, ABS, and traction control were banned for ’94. The new rules meant that traditional passive suspension returned, and the drivers had to control wheelspin manually. 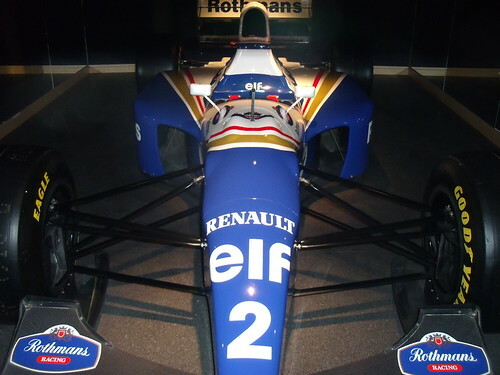 The team proudly displayed Senna, Hill, and the FW15D “interim” car to the World’s media. The new livery looked smart, and everyone was expecting the Williams team to run away with both championships for a fourth consecutive season. The team used the FW15D for pre-season testing until late February, but the car wasn’t all that quick, compared to the new Jordans. The ‘D’ variant’s suspension and aerodynamics were designed around active suspension, and it was more of a compromise than anything. Frank Williams would later describe the car as “mediocre”. The new FW16 was designed for passive suspension, and would make its first appearance during a pre-season test at Silverstone, in March. Much was expected of the new car, and of Senna. Unfortunately, the 1994 season turned into a nightmare, and Senna’s death on May 1 1994 would shake the team to its core.